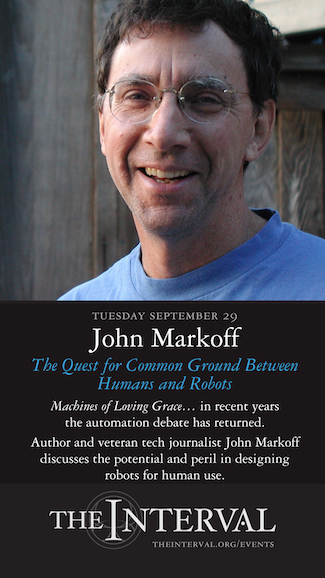 Veteran technology writer John Markoff speaks in Long Now’s “Conversations at The Interval” series this Tuesday. He will discuss his new book Machines of Loving Grace: The Quest for Common Ground Between Humans and Robots which covers the birth of artificial intelligence in the 1950s all the way up to the consumer and industrial robotics innovations of today. Long Now’s Paul Saffo will interviewed Markoff onstage. Tickets to this talk sold out very quickly, as our Interval events often do. Due to the huge interest in this event, Long Now will be live audio-streaming Tuesday’s talk for members. You can join Long Now for just $8/month which includes tickets to Seminars, HD video of 12 years of Long Now talks, and many other benefits. Current Long Now members, just login on the member site. The stream will begin at 7:15pm Pacific. In recent years, the pace of technological change has accelerated dramatically, posing an ethical quandary. If humans delegate decisions to machines, who will be responsible for the consequences? Drawing on his forty years covering the tech industry, Markoff conducted numerous interviews and extensive research to assemble this history and poise key questions about how we will cohabitate with our robotic creations. This will be the third time we have live streamed an Interval event. Due to our limited resources, it is not possible to do so for most talks. We do plan to release Interval talks as podcasts and video on the Long Now site (similarly to our Seminar series). 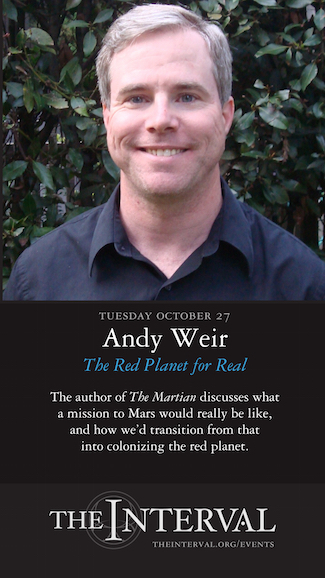 We also plan to stream the talk by Andy Weir author of The Martian which takes place at The Interval on October 27, 02015. Tickets will go on sale for that talk two weeks beforehand and we expect it will sell out quickly. Long Now is looking for a major sponsor to fund the cost of producing the series to the standard of our Seminar media. We are also seeking a sponsor to support more regular streaming of Interval events. Sponsorship inquiries are welcome.